Simon Yuen and Jackie Chan do the Three Stooges. The Skinny: The old school martial arts classic that helped make Jackie Chan a superstar. Snake in the Eagle's Shadow is a fun, breezy little film, easily ranking among the best from Jackie's pre-Police Story era. After a string of flops with director Lo Wei, future HK megastar Jackie Chan was loaned out to Ng See Yuen's Seasonal Films to headline the company's latest martial arts project. With Chan a seeming box office liability, no one could have anticipated the huge success that Snake in the Eagle's Shadow would become. Chan plays Chien Fu, a down-on-his-luck orphan who does odd jobs for the local kung fu school. Chien Fu soon meets Pai Chang-Tien (Simon Yuen), a so-called beggar who is, in actuality, a master of the snake fist style. So why the beggar disguise? 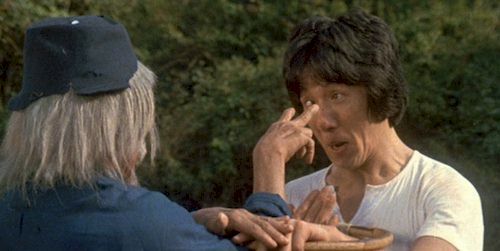 Well, it seems Beggar Pai is on the run from Shang Kuan-Yin, an eagle claw master played with dastardly aplomb by Korean martial artist Hwang Jang-Lee. While in hiding from that nutjob, Pai teaches Chien Fu the intricacies of the snake fist style in a series of hilarious, but grueling exercises (i.e., finger pushups over lit joss sticks, no thanks!). Chien Fu soon learns that the eagle claw technique has an effective counterattack for every single snake fist move, so he invents the "Cat's Claw" style to beat Shang for good. Before the inevitable duel to the death, there's eome fighting between rival schools, the appearance of a treacherous Catholic priest, and some possible cruelty to animals (I highly doubt PETA sanctioned the fight between the cat and the cobra!).  Hwang Jang-Lee knocked out Jackie Chan's teeth while making this film. Watch carefully during the final fight.